There is incredible power in simply showing up. This is true in parenting, it’s true in coaching, it’s true in teaching, and it’s true in leadership. Over the years I’ve observed many church leaders who overestimate the potential of a pivotal moment and underestimate the power of faithfully showing up every day. When you show up daily, your leadership ends up showing up over time. Your most meaningful relationships, trust, culture, and influence. While all of them can be destroyed in a moment, none of them are built in a moment but in a series of moments over an extended period of time. Never underestimate the power of following through and doing what you said you were going to do. Delivering on time and on target on mundane everyday deliverables will take you further than you think. Leadership can be a lot like sports and life; you miss 100% of the shots you don’t take. Most opportunities are missed in life because people don’t show up and take them. Sometimes you need to stop worrying about the next big thing and just do the next right thing. It may be less glamorous, it may seem like it won’t get you as far as fast as you want to go, but it will help you build the necessary character, discipline, and practices that will get you there. Be faithful with what you’ve been given and you’ll probably be given more. If you’re familiar with the Bible you’re probably familiar with this principle. Don’t underestimate the power and faithfulness that comes from showing up every day. In 2014, I had a front row seat to the handoff of senior leadership of a multi-mega church from one Lead Pastor to another. Serving on the Executive Team at that time I had the privilege of having a behind the scenes view to the whole thing, start to finish. Scott Ridout, who now serves as the President of Converge Worldwide a movement of over 1,300 churches that have joined together to start and strengthen churches, served in leadership at Sun Valley Community Church for 16 years before handing it off to Chad Moore who now serves as the Lead Pastor. Both are fantastic leaders and even better men. Now a couple of years removed from leading through that transition with them there are a few things that stand out to me that made the transition successful. If your church will be going through a leadership transition in the future you may want to keep these principles in mind. Chad had joined the staff at Sun Valley back in 2004 and had already been on the team for 10 years when this transition happened. When you like the culture that you have you hire from the inside, when you want to change the culture you hire from the outside. As a result of leading together up close and over time trust had been built with 4 unique and important audiences. The church body, the staff, the board, and of course trust had been built between Chad and Scott. That public buy-in and private trust provided a foundation for the transition to succeed. Due to his tenure at Sun Valley, Chad embodied the culture we were trying to create. If we had hired someone from the outside it would have marked a change in culture and with it a period of turmoil. While both men are fantastic leaders, they are different leaders. But they are both high capacity leaders. While gifted uniquely they both have a high capacity. When there’s a new leader you don’t want people hoping that they’ll grow into the role. We didn’t have to worry about that in this case. The best time to make a baton handoff is at full speed. The best time to make change in a church is when you have momentum. Sun Valley had just gone multisite 3 years prior to this succession and was (and still is today) experiencing new growth. Scott had a very clear calling in all of this to become the next President of Converge. Without a clear next step for the exiting Sr. Pastor this would have gone completely different. I could have easily led with this one. Humility was the chief characteristic that provided the right environment for the transition to be as successful as it was. Both men chose to do what was best for the church at every juncture in the process rather than grasp for power, prestige, preference or position. One thing is true of strong church leaders: they fight for healthy growth. Are you willing to explore beyond your ministry routines to discover the strategies that will help you lead your church at a higher level? This fall, we invite you to take your next steps with a community of like-minded church leaders. In our new Leadership Coaching Networks, you’ll learn best practices from healthy, growing churches and begin applying them in your church environment from day one. Clarify what’s working and what’s not to define the best action plan to support health. This network is designed to help you move from reaching hundreds to reaching 1,000 in attendance by clarifying what’s working and what’s wrong, defining an action plan for next steps, and establishing a staffing and ministry structure that supports growth and health. Discover how to address leadership development,discipleship and more through healthy growth engines. This network will help you develop strategies to tackle the unique challenges of larger churches including leadership development, staffing, communications, discipleship and establishing healthy growth engines. Learn the best strategies for leading and growing a multisite church. This experience will set you up to more effectively lead a growing, multisite church. We will help you navigate Common Pitfalls in Multisite, Refining Your Model, Clarifying How You Structure and Operate, Best Practices for Launching a Campus, Managing the Tension (Central vs Campus), and more! We have space for just 7 churches in each network — and, we’re offering $1,000 off registration to the first 4 churches who register for each! Check out the details to decide if this is the right next step for you. Like it or not, millennials are making their way into leadership roles in churches across America. As they take their newfound place in church leadership many of them are looking for someone to invest in them and help develop them as young emerging leaders. Experienced leaders are always going to have more opportunities available to say yes to than capacity to meet them. This is true in leadership and this is true in developing young talent. You have to make a choice. So, choose wisely. How do you know who to invest in and who to ignore? Young, naïve, and inexperienced talent doesn’t bother me. But young talent that is void of the following four intangibles scares me to death. Skills can be trained but talent is developed. Talent is something you have or you don’t have. It’s something you’re born with or is gifted to you by the Holy Spirit. You get the gifts you’re given. For instance, if someone has been given the spiritual gift of leadership, it can be developed and that art can be perfected over time through study and practice. Others without the spiritual gift of leadership may learn leadership skills but they’ll never have the talent to lead at the same level as someone with a leadership gift. I’m looking for young leaders who are very talented. In a world where everyone gets a participation trophy and kids are taught that they can do anything and be anything they want to be in life; what I’m about to say isn’t going to be very popular. But it will be true. While different people may have similar talents, they may have different capacities. The Bible is clear that while many people may get similar or even the same gifts, that they are given in different measure. So, no you can’t be anything you want to be, but you can be the best you that you’re designed to be. That being said, I’m looking for young leaders who have a high capacity. In the book of James, he Bible teaches us that “God resists the proud but gives grace to the humble.” You can’t give something to someone who doesn’t want to or isn’t ready to receive it. (both matter by the way). You can’t teach someone who isn’t teachable. I’m looking for young leaders who demonstrate a teachable spirit. It’s okay for a young leader not to have an answer, but it’s not okay for that same young leader to not go find the answer. It’s okay for a young leader to fail and not get everything right the first time. It’s not okay for a young leader to not try as hard as they possibly can to succeed. I’m looking for young leaders who demonstrate tremendous effort. Talking with the leadership team at your church about money can be tough. Changing the way you spend it is even harder. If you have a strategic plan you’re working with your leadership team to implement, it’s important to start a healthy conversation about finances to effectively navigate this touchy subject together. It isn’t unusual for a church to create a strategic plan, then fall short of actually funding it. The leadership team might work together beautifully to create a strong plan and commit to working it, but too often, they find themselves locked into ineffective or foolish budgeting patterns. Eventually, they might find that their vision is only partially funded…or they might set it aside altogether. 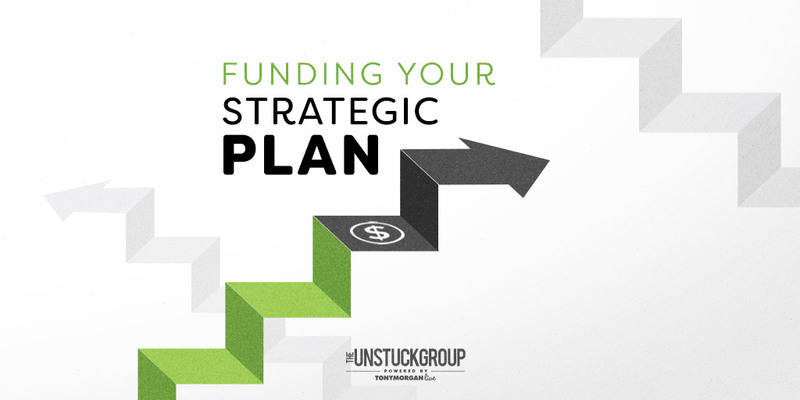 That’s why at the Unstuck Group we’ve created Funding Your Strategic Plan, a practical guide full of insights and conversations that will help you and your team assess your church’s budget with a critical eye, develop an effective, vision-minded budget around your growth engines, and change the way you and your staff direct your available resources.